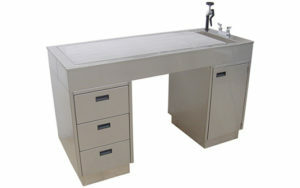 Vet Techs and practitioners tell us they love our inventive Water-Flo veterinary table because it makes their lives easier. 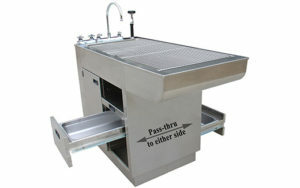 Imagine cleaning your treatment tables and dental tables with a quick faucet turn. 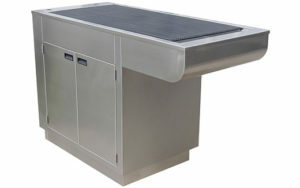 Nothing could be easier than our TriStar Vet engineered solution. 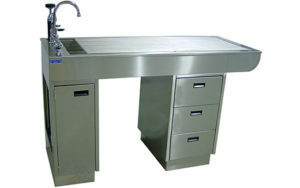 See our Water-Flo veterinary table in action (video). 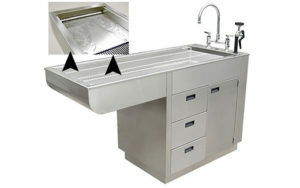 Not only do we offer quick-rinse cleaning, we engineered our stainless steel veterinary tables with a number of helpful cabinet options, including pass-through drawers, pull out writing shelves and removable inner panels and doors that provide easy access to wiring and plumbing. 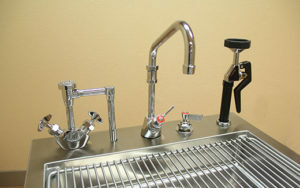 Click any photo below to see your sink and cabinet options.